Hi Royal Caribbean Blog fans, it is Michael Poole here again for another live blog coming from Majesty of the Seas. If you recall, I did a live blog on Majesty of the Seas in October of 2015 - let that hold you over until I set sail this weekend. This is such a unique cruise for me, because Majesty of the Seas sails 3 and 4 days cruises. As you know, these are quick Bahamas getaways and I really enjoy them. However, on this cruise I’m actually staying on board for three consecutive sailings. The first leg is 3 days, then 4 days, and ending with another 3-day weekend cruise. I booked the first sailing (1/13) with a friend of mine sharing a cabin for a great rate. Who does not enjoy a nice weekend getaway to the Bahamas. As time got closer, I started looking at my vacation time and thought to myself, "Why don’t I book the 4-day sailing after to have a back-to-back cruise?" So I booked the next sailing solo and could not be more excited to have a longer cruise. About a month ago, I talked to my friend who is sailing with me on the first cruise about the 1/20 weekend cruise. He is a casino VIP and was actually able to get that cruise free under his recent casino play. So, very long story short, I will be on 3 sailings for a total of 10 days! Well, I suppose the only negative part of having 3 cruises in a row, is that I’m in a different cabin every sailing. I tried to upgrade my leg 2 – 4 day solo cruise to the same cabin but the cost was too much for me going solo. I’ve changed cabins on back-to-back sailings before and the crew actually moves everything for you. In fact, they tell you to leave everything on hangers and they move it into the next closet for you. I would recommend just talking with both cabin attendants prior to the change. All 3 sailings are going to the same places, so I will have 3 trips to Nassau, Bahamas and 3 “planned” trips to Royal Caribbean’s private island Coco Cay. I say "planned trips", because usually in the winter months, they tend to miss stopping at Coco Cay more due to high wind. I will also have 1 sea day on my 4 day sailing which is leg 2 Monday – Friday. My plans in Nassau are to visit my favorite local pub and enjoy some beach time at Junkanoo beach. For Coco Cay, just enjoy the private island and relax in the sun and explore the backside of the island where you can find the new floating bar. If you have followed my live blogs before you know I usually purchase the drink package, as I find it a great value. However, after thinking about the cost of 10 days and actually drinking that much for 10 straight days – I’m not getting the package. I have pre-purchased a bottle of rum with the new in-cabin bottle service for leg 1, which was $40. I will also be carrying on six bottles of wine, likely 3 reds and 3 bottles of champagne. Royal Caribbean allows each guest to carry on 2 bottles per cabin and since I’m on 3 sailings, I can carry up to 6 bottles. I look forward to taking you along with me over the next ten days. This will be such a different experience for me, so it should be a great live blog. Have you ever sailed on Majesty of the Seas? Royal Caribbean Blog contributor Michael Poole is on Majesty of the Seas this week. Today we are docked in Key West, Florida from 10:00 am - 5:30 pm. It was fun being able to connect with friends at home with full phone service again, since we were in Florida. I spent my morning up in the Viking Crown lounge enjoying my daily Starbucks. I purchased my coffee daily at $3 from the café, and it was worth it for me. At 9:30 am, they started the immigration process, which was a little unorganized. They had two locations you had to attend one for United States citizens and another line for everyone else. Surprisingly the line for non-United States citizens was extremely long, had no idea I was cruising with that many people from other countries. I decided to enjoy some champagne in the Schooner Bar and I’d head out later. Somehow, I must have missed the announcement that all guest are required to take part in the immigration process, even if you were staying on board. I was enjoying my morning and just caught the immigration officers packing up when I went down at noon. They informed me I would have received a $200 fine had I missed them, so maybe that’s why I saw everyone in lines all morning! Hey at least I made it just in time. I didn’t have any real plans for my day in Key West, I just wanted to explore the streets. I walked around for around an hour before coming across the famous Sloppy Joes. The restaurant has been opened since 1930’s and many of the bartenders have been there for 30+ years. They had live music going and it had that fun Key West feeling. I didn’t try any of their food, since I ate lunch on board at the Windjammer, but many were and it looked good too. If you are curious about the bar they have four live webcams on their website and they are pretty fun to watch everyone having fun. This afternoon. I decided to lay on the pool deck and enjoy the last few hours of sunrays I had left. Something a little different happen to me, I was enjoying a cold beer in a pool lounger when I was approached by a bar staff. He asked for my sea pass card to bring me another beer, I said okay. He comes back with a bucket of three beers, and I had the drink package. Usually Royal Caribbean only lets you get one drink every 5 minutes, to help prevent people from sharing. I laughed and thought well it is the last day of my vacation, why not. Tonight, I just wanted to be social with the friends I had made and enjoy the evening. I tried to go settle my on board account with guest services until I saw their line; it was crazy down there. So those who need to take of things at guest services my advice to you is go early. I spent part of my evening in the Viking Crown lounge, saying good bye to the friends I’d met, most were staying on for a few more sailings, living the good life. It’s part of the reason I enjoy cruising so much, is all the people you meet from all over the world. For dinner I was back in the main dining room for my final meal. It was pasta themed menu, who couldn’t enjoy that! I knew I wanted the tiger shrimp, but I kept thinking about the lasagna too, so I ordered both! Yes, I was that guy but why not it’s one of the many perks of cruising. Once again tonight the waiters sang for us, and it was fun to recognize the ones that have been serving us for the past week. That wraps up my 4-day cruise on the Majesty of the Seas, and wow, did it go by fast. I hope you enjoyed following along with me, as much as I loved sharing. Let me know if you have any questions about the ship, my stops, or solo cruising. Until next time, see you out at sea! Good Morning from Royal Caribbean’s beautiful private island called Coco Cay. This is one of my favorite places to visit and has been for years. I wanted to get off as early as I could to take some pictures of the island before other guests were around. I’d also recommend getting off early to just explore before it gets crowded. One thing that’s different about Coco Cay is you don’t actually dock at the island, because there is no pier. In fact, you take a tender boat over to the island, which can me less than enjoyable at times if there are lines. However, when you go down early there were no lines and I enjoyed the short ride over to Coco Cay. Also a great time to take pictures of the ship, so take your camera. Once I stepped onto the island I saw a table selling coolers/buckets of beer for $30 and buckets of water for $20. They did have a new all blue cooler with the Royal Caribbean logo on the bag, I wanted one but since I had the drink package it’s not worth it for me. Now it was time to explore the island and head over to barefoot beach. Years ago you could sit on Barefoot Beach and be the only one there, now more people have discovered it. If you still want to check it out you just go down to the shoreline and walk right, you can’t miss it. They also have hammocks near by to take an afternoon nap, now that’s what I call paradise. After exploring a bit I decided it was time to grab some of their island BBQ lunch. They were serving hamburgers, hotdogs, ribs, and bbq chicken. I’m going to try to be as honest as I can about the meal, well I didn’t like it. I’m sure if I got a burger you can’t really go wrong there or even a hotdog. I took a couple of bites and just threw it out, I’m not a picky eater at all, but I decided I’d eat back on board. They did have some great looking pasta salads and fruit, just didn’t try any to give feedback on. Now that it’s in the afternoon hours I decided to head back to the ship and have lunch at Johnny Rockets. This restaurant has a cover charge of $6.95 per person and includes their tips in the cover charge. I asked them about the price; because that’s a dollar more than I’ve seen on other ships and they said it’s been that price for a while on Majesty of the Seas. This surprises me because every time I saw the restaurant it was always empty. I enjoyed the smoked house burger that comes as a double but I just asked them to make it as a single. They also brought out endless French fries and onion rings; I had to tell them no more! I also enjoyed the worlds famous apple pie with ice cream, this is a must have if you eat here trust me. After all the sun and food it was naptime for me. Tonight, I decided to explore some other things around the ship instead of going to the Viking lounge for the Diamond event. They had some really fun music in the centrum playing Bob Marley theme songs. Sadly, there is really nowhere to sit and enjoy the music like on the Vision and Radiance class. I also spent some time in the Schooner Bar listening to the piano bar and it was for a great evening. Someone even requested him to sing Rocky Top, and being a Vol myself I got really excited and started to sing along. Dinner was in the main dining room again and we had a new couple sit with us, but they also didn’t know English, at this point we could only laugh. That’s okay the solo group was there and we all enjoyed the meal. I ordered the French onion soup, (I kept thinking about the one Chops Grille serves!) the roasted duck, which was so tender it just fell off the bone. After our meal the servers started singing and dancing around the dining room, always a fun for them and the guest. To close out my evening, I attended the Quest adult game show at 11:15. Sad to report I didn’t play, the lounge was so packed and when I arrived it was standing room only at that point. So the key to playing is go a little early, but it’s almost just as fun to watch. If you are not familiar with the show, I recommend you go next cruise, just leave the kids in the room. To keep it a surprise for those who have never been, we will just leave it at that. That wraps up my full day in Coco Cay and back on board, tomorrow we head to Key West, Florida! Good morning from beautiful Nassau, Bahamas! This morning I woke up at 6:55am to watch the sunrise on the top deck. It’s kind of hard to believe after all these years I’ve been cruising I’ve never watched sunrise, who likes to wake up early on vacation? Well I am so glad I did because the views at sunrise are absolutely breathtaking. Since I was already awake I decided to get ready for the day in Nassau, I walked off around 8:45am and might have been too early. None of the shops were even open at this hour, but I just explored for a bit. That’s when I found Starbucks on Bay Street, so I stopped in for a coffee. They also have very high speed Internet for $3.25 for one hour on one device. This was well worth the price if you ask me and the Internet on board is not so great. After my hour of Internet was up, I decided to try something different this time in Nassau. I went to explore the John Watling’s rum factory, if you search their website it’s a little walk by not bad. I actually saw a few people getting dropped off in taxis while I was there, but the walk is less than a half hour. Once you arrive they greet you with a rum sample, yes please! They offer a free tour that’s around 10 minutes; learning about the history of John Watling’s himself, how the make/bottle the rum, and you get to smell all the different options. After the tour you end up in a gift shop where they sell their rum for around $30. They also have a bar where you can try their rum; the special is 2 drinks for $18. I had a great experience here and would recommend this to anyone that’s looking for a different experience in Nassau. Okay, now it’s time to walk back! While I was walking back I thought about stopping into Senor Frogs for some drinks and lunch, but this is as close as I got. I decided to spend the afternoon on board and enjoy my drink package. If you like a fun, kind of wild experience then you should stop into Senor Frogs, I just wasn’t in the wild mood today. For lunch I wanted to try Johnny Rockets, but they didn’t open until 1:00pm and it was noon, so I settled for the Windjammer. The food in here is okay, nothing too special to talk about but always a lot of options. If you ever want a peaceful day on board a half empty ship, you could always stay on board while in port. The ship was very empty and was quite relaxing poolside with very few people around. Not a whole lot to report for the afternoon other than, sleeping poolside and enjoying some cold Stella’s. They did have a great live band that played music all afternoon and the guests were really getting into it, as was I. This evening, I decided to head back up to the Diamond event in the Viking Crown lounge. One of the other solo cruises joined me for cocktail hour and watched another breathtaking sunset. I know I told you yesterday, but best seat in the house for sunset. Tonight’s dinner is always my favorite menu all week, I thought about trying something else, but didn’t want to miss this menu. They have to lobster soup, shrimp cocktail, filet of beef, and strawberry cheesecake. And yes, I had all of that for dinner! They also had duck that looked like a great option as well, but for me it was all about the filet of beer. This cut of meat is so tender and once again she got me a special cut that was rare. Might have been the best dining room meal I’ve had to date on any Royal Caribbean ship. I will note they put a family with us tonight that didn’t speak English, so that’s always entertaining to say the least. Since we didn’t leave Nassau until midnight they had a pool deck party for sailaway. They did a great job getting the guest out there dancing with some team games and it slowly dragged more out there. Sadly, I decided not to take my big camera out there and just enjoy the evening so no pictures to share. But I noticed they were playing mostly Latin/Hispanic music. There are a lot of Spanish speaking guest on board, in fact every announcement is spoke in English and followed by Spanish. The dancing lasted into the morning hours, the compass said 3am, but I crashed the party at 1am. Hope you enjoyed my relaxing day in Nassau, stay tuned because Coco Cay is next up! Well friends my cruise day finally made it! I compare this day to a child on Christmas morning, okay maybe not but very close. I woke up at 6:00am to watch the Majesty of the Seas sail into Miami on the port webcam. This has become one of my recent tradition the morning of the cruise, just helps me contain all the excitement. I left my hotel in Ft. Lauderdale at 8:00am with every intention on having breakfast in Miami. Little did I know the traffic on I – 95 South on a Monday morning was a total lock down! I arrived to the rental car place at Enterprise a little after 9:30am; yes it took that long to get to Miami. Once I arrived to return the car, they asked if I needed a ride, and I told them I was going to the port, but they declined that they couldn’t take anyone in. No problem, on the morning of the cruise you don’t sweat the small stuff, there was a line of taxis there waiting and I jumped in. I arrived to the pier right at 10:00am and I saw hundreds of guest that were standing on the sidewalk that had just gotten off. I always hate that moment coming off a cruise and seeing all those happy guest ready for their cruise, but hey it was my time! Check-in was very easy, but they didn’t let us on board until 11:00am. Like other ports there are chairs for the guest to sit down in, but in Miami you stand in rows. I personally didn’t mind standing, but I could see some guest upset having to stand for almost an hour. They did have a few chairs for those who had a hard time standing, but not many. Finally at 11:00am they let the guests onboard and I was around the 5th person to make it on. I headed straight up to the pool deck to take some pictures and boy I’m glad I did. The city of Miami of absolutely beautiful and I’m surprised more Royal Caribbean ships have not sailed out of here for the past decade. In fact, Royal Caribbean actually had their corporate office here in Miami, which was right beside the pier. Now that I’m finally on board and have a few pictures out of the way, there is only one thing to do and that’s to eat! They had the windjammer open for lunch at 11:00am, so it was perfect timing. The Windjammer can be found across all Royal Caribbean ships and it’s buffet style. My view on the Windjammer is some items are great and others are not my favorite, but that’s okay you can go get more of what you like. Okay I need to be honest about something; I went back for another round an hour later for their world famous kummelweck roast beef sandwich. These are served in the compass deli and no one was even there! The location is a little weird, because it’s one level up in the Windjammer and then walk into the back area. After my second round of lunch, I decided to go check out my stateroom on deck 3. Cabin 3601. I booked an inside cabin since it was just me cruising and the cabins don’t do a whole lot for me. I will say that cabin would be a little tight for two people, but manageable. When I arrived in my cabin the Coca-Cola souvenir cup, that comes with the drink package, was already sitting in my cabin. Since we are on that topic, I’ll let you know I purchased the select package for $42 per person, per day. This package includes unlimited wine $8 and under, all their house wines are $8 and unlimited beer. What this package does not include is bottled water and cocktails. Since I get the free cocktails in the diamond lounge, I find the select package to be a great deal for me. Sailaway time finally arrive at 4:00pm I decided to do a live Periscope as we were leaving, so thank you to those that joined me. They had a DJ playing music and all the Royal Caribbean singers and dancers out there getting the party started. This is that one moment I finally feel like I’m on vacation, do you have that one moment that gets you excited? Tonight, I headed up to the Viking Crown lounge on deck 14 that big round section on top of the ship. If you ever want a nice relaxing, romantic place to watch the sunset in the evening, this is it. The Majesty of the Seas does not have the Crown & Anchor Diamond Lounge like many of the other ships do, but they host the event in the Viking Crown lounge. They offer you cocktails, wine, and beer at no cost to those diamond members and above. I decided to stay up there until dinner because it was just so peaceful and the sunset view was breathtaking. Dinner time finally arrived and, let’s be honest, this is the best time on any cruise! I requested a large table to ensure I was not having dinner alone. When I arrived to my table I quickly found out Royal Caribbean put all the solo cruisers together for dinner. I’ve never had them do this before on any of my solo sailings, but I was grateful for it. The service was great with no issues to report and the food was outstanding. I enjoy my steak very rare and asked the server to find me a great cut of the prime rib and she did! This might have been the best prime rib I’ve ever tasted; I’m getting excited just blogging about it! After dinner headed to straight to bed, no dancing for me tonight. Until tomorrow thanks for joining in on my first day! Royal Caribbean Blog contributor Michael Poole is about to go on Majesty of the Seas this weekend and here's his preview of his cruise! Hi Royal Caribbean fans, it’s Michael Poole here again. Today you're in for another live review from sea, but not quite yet. 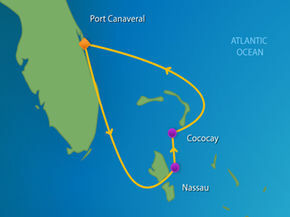 Starting tomorrow I’m boarding the Majesty of the Seas for a 4 night cruise sailing to Nassau, Coco Cay, and Key West. This is a new ship for me, and it’s been years since I’ve sailed out of Miami, Florida. Royal Caribbean recently announced they were going to keep Majesty of the Seas in their fleet and do major upgrades to her come spring 2016. She won’t be upgraded when I sail on her tomorrow, although it will be nice to compare and contrast after the upgrades. This morning I flew into Ft. Lauderdale, Florida. I’m staying at the Hilton Marina waterfront, mainly so I could watch the Independence of the Seas sail away. Yes, I’m that big of a Royal fan! If you happen to have a husband that loves large yachts, you might want to book this hotel. There's plenty of them to look at! I booked my room for $120 and my balcony view is by far the best I’ve ever had, I mean look at this yacht! As I previously mentioned I decided to stay in Ft. Lauderdale instead of Miami just to watch a Royal Caribbean ship sail away. If you are anxious to get to the beach, I've written a post on how to get out there. It's a really great view to watch the ships coming and going. My plan for this cruise is just to relax and enjoy some sunshine; it has been rainy in my home town Atlanta, GA for weeks now. I hope to bring you with me virtually and share my experiences on board. I will respond to questions throughout the day, so if you have any questions please just ask! Until the next post, see you at sea!